Prior to the proposed development of a new Mosque and the associated planning, design and subsequent construction works, a non-invasive underground mapping survey was required in order to locate and map as accurately as possible any buried known and unknown services and utilities that may be present within Phase 1 of the proposed works areas. Geotec Surveys met with the client on site prior to a quotation being provided in order to understand their specific requirements. The survey areas comprised a mix of access roads and hard standing walkways, a large open grassed area and other sections of soft and hard landscaping around and between existing site buildings. To achieve our objectives, we employed a selection of techniques and technologies including ground penetrating radar (GPR), radio-frequency locators (EML) in active & passive modes, threading, direct signal induction and use of sondes & sounding. These physical detection methods were referenced with statutory undertaker’s records and other, relevant site drawings and/or local site knowledge, to enable us to produce the final survey results to the best possible standard. In general the depth of penetration of our underground mapping survey was 2 metres from ground surface and our results displayed the position, depth and utility type for any buried services and utilities, regardless of the material of construction, including power, water, gas, telecommunications and other conductive and non-conductive services. 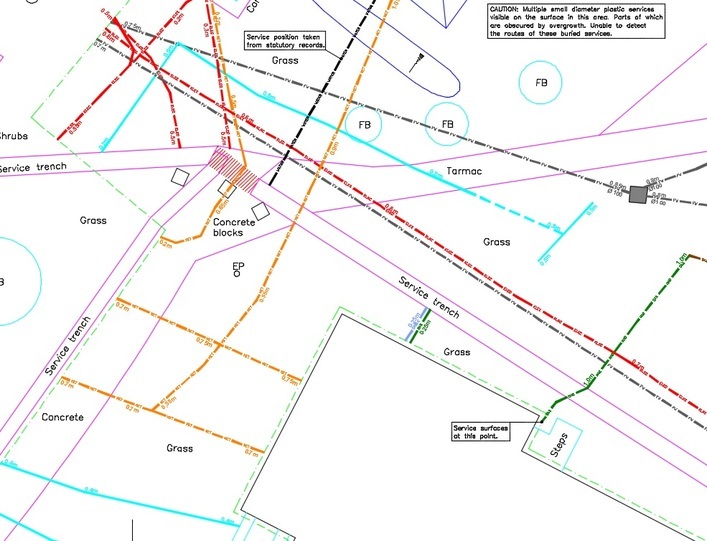 Our time on site also included for the collection of detailed topographical reference data so that all findings from the underground mapping survey could be overlaid onto the topographical survey drawing provided by the client. The survey results have allowed the client to provide as much information as possible to their architects to ensure that they achieve the most economical and effective design for their new Mosque as feasible. In this instance, the final survey results were presented in 2D plan view, electronic and hard copy format and show a number of unknown and services inaccessible from manholes are strewn across the site, as demonstrated by the blue unidentified linear GPR targets and the orange unknown metallic features shown on the above drawing extract.